What were the conditions for the ten-game match in 1910 between Emanuel Lasker and Carl Schlechter? In particular, did Schlechter have to win by a two-point margin to gain the world title? Since 1982, a series of C.N. items has considered these matters and has examined the concluding game, which Lasker won. If he did, then it was the inspiration of the century. Dr Perlis had died, from a mountaineering accident, in September 1913. ‘According to Part I of My Great Predecessors (page 183), the game was adjourned at 32...Qh5+ “(or a move earlier) ... and resumed the following day”. Of course, Kasparov and CHESS are not primary sources. 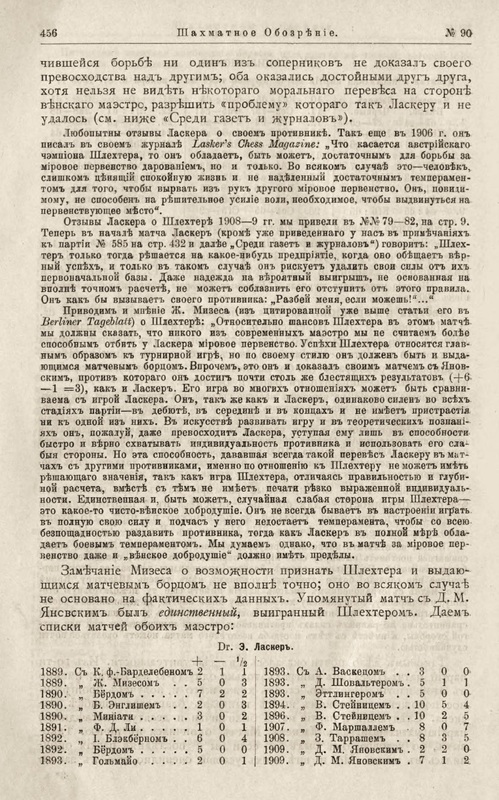 Pages 163 and 165 of the April 1910 issue of the BCM mention adjournments after Lasker’s 15th and 58th moves. 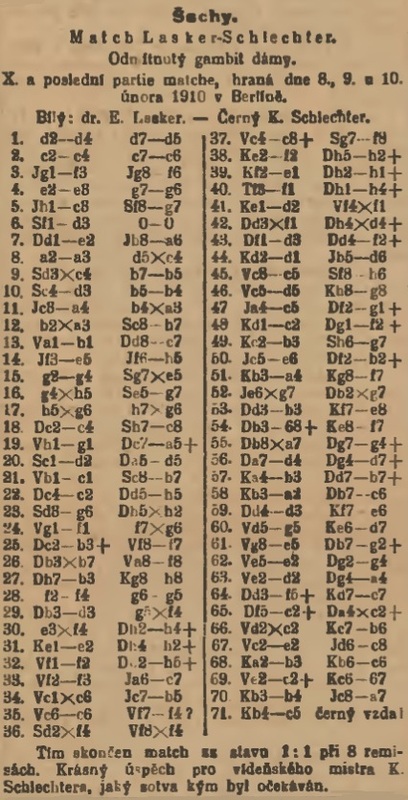 One of the more reliable primary sources of the time was Deutsches Wochenschach, which gave the tenth match-game (played in Berlin on 8, 9 and 10 February) on pages 61-62 and 67 of its 13 February 1910 issue. 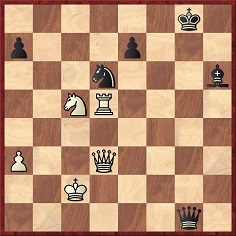 It stated that after Black’s 15th move the game was adjourned until the next day (‘Hier wurde die Partie abgebrochen und am folgenden Tage fortgesetzt’) and that there was a further adjournment (‘abgebrochen’) after White’s 58th move. Other periodicals consulted by us so far have revealed no complementary details. With luck, a reader will be able to check for possible accounts in local newspapers. No chess event requires greater caution by historians than the Lasker v Schlechter match. As shown by magazine and newspaper reports of the time, the regulations evolved between late 1908 and early 1910, but, as far as we know, they were never published in a final, consolidated form. ‘There followed 48…Qc1+ 49 Kb3 Bg7 50 Ne6 Qb2+, etc. Yet it is not so astonishing that nobody has pointed out this continuation, for a queen move from c1 to b6 was against the rules of the game at the time. ‘The result of the late match points to a contest on different terms, a match for the world championship. The ten games lately played constituted a sort of match, but the object was not the settlement of the championship, as many have supposed. If Schlechter had won all the games, Lasker would still have been titular world champion. The champion agreed to play a series of games, but it was expressly stipulated that the result was not to touch the title. This consideration affects opinion of the result. Our item above [C.N. 3252] did, by omission, an injustice to Louis Blair, as we had forgotten that in an October 1989 letter to us he pointed out the discrepancy (to use no stronger word) between the American Chess Bulletin’s 1910 item and David Hooper’s reference to it in CHESS (1976). Mr Blair also discussed the matter in an article entitled ‘The Lasker-Schlechter match: a new look at the published evidence’ on pages 48-55 of the February 1990 BCM. Naturally the ‘two confidants’ are left unidentified, as is the person who revealed the ‘protocol’, as well as everything else that the reader would expect to be told. Corroboration provided by the co-authors for these statements: zero. See also, for instance, page 127 of Grandmasters of Chess by Harold C. Schonberg (Philadelphia and New York, 1973). Anyone wishing to make a careful analysis of such questions as whether Schlechter had to win the match by two points and whether the world title was at stake should evidently begin by studying existing accounts of the controversy. We list below the main items that come to mind, many of which cite material published in 1908-10. August 1975, page 353 (W. Heidenfeld and E.A. Apps). September 1976, pages 380-381 (K. Whyld, W. Heidenfeld). 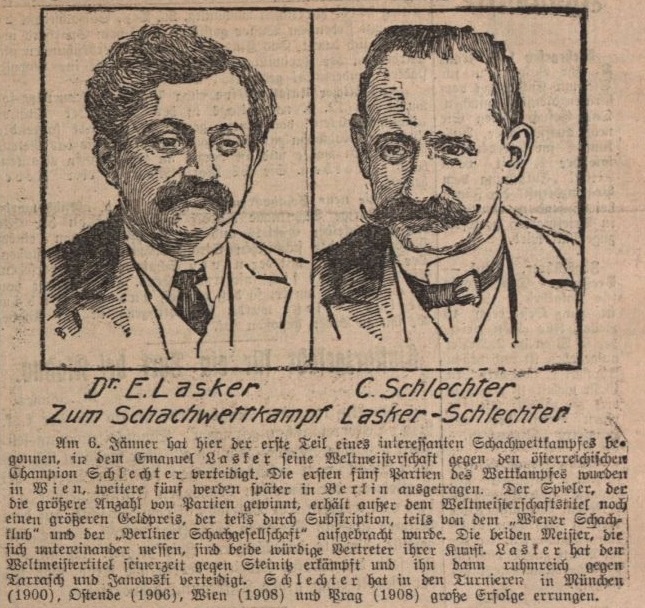 Lasker v Schlechter: the last word by E.A. Apps (Sutton Coldfield, 1976). 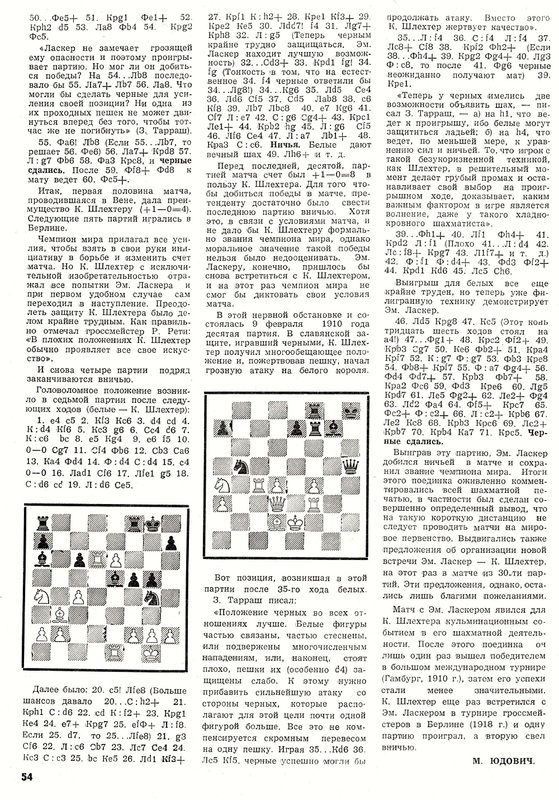 A four-page pamphlet whose text was similar, though not identical, to Apps’ article of the same title in the June 1976 CHESS. ‘Späte Nachlese zum Wettkampf Lasker gegen Schlechter’ by U. Grammel in Deutsche Schachzeitung, January 1977, pages 37-41. Chess Notes: C.N.s 39, 81, 1308, 1762, 3179, 4144 and 5855. 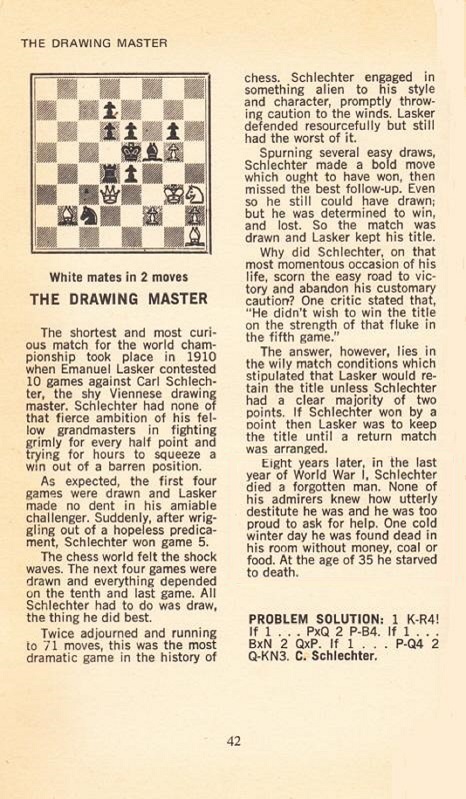 ‘The Lasker-Schlechter Match’ by L. Wright in The South African Chessplayer, November-December 1985, pages 135-140. The South African Chessplayer, February 1986, page 26 (K. Whyld). ‘The Lasker-Schlechter Match: A New Look at the Published Evidence’ by L. Blair in Chess Horizons, November-December 1988, pages 52-62. A shorter version appeared on pages 48-55 of the February 1990 BCM. Carl Schlechter! Life and Times of the Austrian Chess Wizard by W. Goldman (Yorklyn, 1994), pages 428-452. New in Chess, 8/1994, page 59 (comments by H. Ree on Goldman’s book). New in Chess, 3/1995, pages 5-6 (D. Brandreth). ‘Lasker-Schlechter 1910 New Evidence from Viennese Sources’ by M. Ehn in New in Chess, 6/1995, pages 85-93. 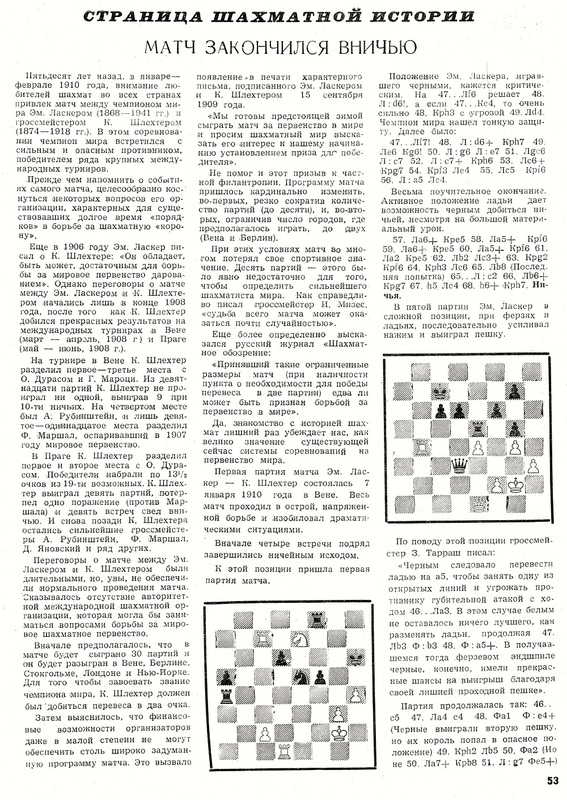 New in Chess, 8/1995, pages 7-8 (L. Blair). ‘Lasker-Schlechter 1910 Neue Fakten aus Wiener Quellen’ by M. Ehn in Schach Report, 8/1995, pages 71-74 and 9/1995, pages 69-72. The whole controversy is a curious one, for evidence tends to point one way, common sense the other. As regards the final paragraph, at the time of his death, in late December 1918, Schlechter was by no means ‘forgotten’; he was the Editor of the Deutsche Schachzeitung and in September-October 1918 had participated in a double-round tournament in Berlin with Lasker, Rubinstein and Tarrasch. His death occurred not ‘in the last year of World War I’ but after the War was over. Nor was he found dead alone in his room at home (which would mean in Vienna); he died in hospital in Budapest. The cause of his death is uncertain. He was then aged 44, not 35. That syndicated column by Evans, riddled with errors though it was, was still appearing in newspapers nearly 15 years after its first publication (on, for instance, page D27 of the Chicago Tribune, 3 May 1987), without even a correction of Schlechter’s age. It is obviously unwise to rely on such material without independent corroboration, but Evans relied on it without even reading it properly. 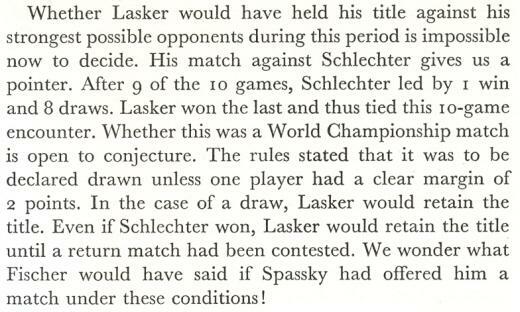 Fraenkel stated, correctly, that Schlechter was aged 35 at the time of the match against Lasker, and not when he died, and he referred to Schlechter being almost forgotten ‘for many years now’ (i.e. from the standpoint of the mid-twentieth century), and not at the time of his death. Despite cribbing from Fraenkel, Evans contradicted him concerning the terms of the Lasker v Schlechter match (for Fraenkel was the ‘critic’ mentioned anonymously three paragraphs from the end of Evans’ article). He also wrote simplistically and categorically about the match on page 49 of The Chess Beat, again with no apparent understanding of what is one of the most complex puzzles in chess history. It is not by chance that criticism of Evans’ published output increased during his later years, as he eschewed writing about chess play (in which he held the grandmaster title) and preferred writing about chess history, lore and politics (in which he held himself up to ridicule). Pages 428-452 of the Goldman book sifted the evidence regarding the conditions for the 1910 Lasker v Schlechter match. Again, no definitive conclusions could be offered. That is how proper writers (not only historians, of course) work. When they know, they explain why they know. When they are uncertain, they explain why they are uncertain. When they do not know, they either say that they do not know or they say nothing. That is honest writing which treats the reader with respect, and there is no other kind worth doing. 1 d4 d5 2 c4 c6 3 Nf3 Nf6 4 e3 g6 5 Nc3 Bg7 6 Bd3 O-O 7 Qc2 Na6 8 a3 dxc4 9 Bxc4 b5 10 Bd3 b4 11 Na4 bxa3 12 bxa3 Bb7 13 Rb1 Qc7 14 Ne5 Nh5 15 g4 Bxe5 16 gxh5 Bg7 17 hxg6 hxg6 18 Qc4 Bc8 19 Rg1 Qa5+ 20 Bd2 Qd5 21 Rc1 Bb7 22 Qc2 Qh5 23 Bxg6 Qxh2 24 Rf1 fxg6 25 Qb3+ Rf7 26 Qxb7 Raf8 27 Qb3 Kh8 28 f4 g5 29 Qd3 gxf4 30 exf4 Qh4+ 31 Ke2 Qh2+ 32 Rf2 Qh5+ 33 Rf3 Nc7 34 Rxc6 Nb5 35 Rc4 Rxf4 36 Bxf4 Rxf4 37 Rc8+ Bf8 38 Kf2 Qh2+ 39 Ke1 Qh1+ 40 Rf1 Qh4+ 41 Kd2 Rxf1 42 Qxf1 Qxd4+ 43 Qd3 Qf2+ 44 Kd1 Nd6 45 Rc5 Bh6 46 Rd5 Kg8 47 Nc5 Qg1+ 48 Kc2 Qc1+ 49 Kb3 Bg7 50 Ne6 Qb2+ 51 Ka4 Kf7 52 Nxg7 Qxg7 53 Qb3 Ke8 54 Qb8+ Kf7 55 Qxa7 Qg4+ 56 Qd4 Qd7+ 57 Kb3 Qb7+ 58 Ka2 Qc6 59 Qd3 Ke6 60 Rg5 Kd7 61 Re5 Qg2+ 62 Re2 Qg4 63 Rd2 Qa4 64 Qf5+ Kc7 65 Qc2+ Qxc2+ 66 Rxc2+ Kb6 67 Re2 Nc8 68 Kb3 Kc6 69 Rc2+ Kb7 70 Kb4 Na7 71 Kc5 Resigns. ‘Lasker published this game in Pester Lloyd in three parts (moves 1-15 on page 8 of the Morgenblatt of 11 February 1910, moves 16-43 on page 2 of the Abendblatt of the same day, and moves 44-71 on page 2 of the Abendblatt of 12 February 1910). Schlechter published the game-score on page 219 of the Allgemeine Sport-Zeitung, 27 February 1910. 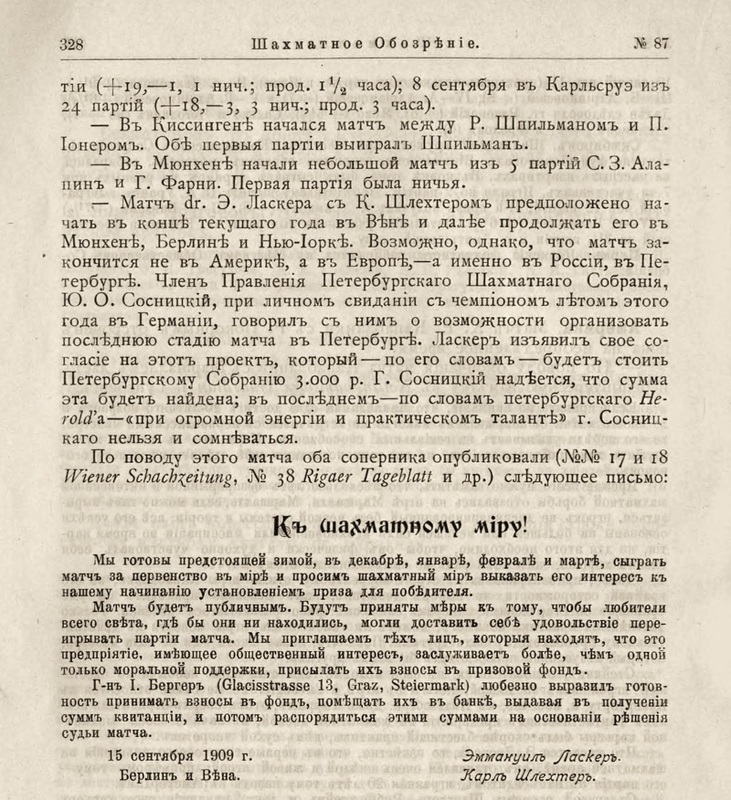 The wrong move (48...Qf2+) was given too in Časopis českých šachistů, June 1910, page 97. Other newspapers reported correctly 48...Qc1+, e.g. Berliner Tageblatt, 11 February 1910 (Morgen-Ausgabe, on the first, unnumbered page of the 1. 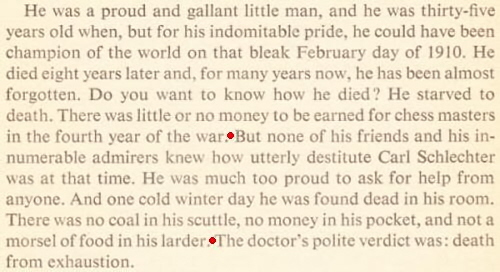 Beiblatt) and the Times, 12 February 1910, page 12. A second difference in the score appears quite often: instead of 66...Kb6, as Lasker and Schlechter recorded, 66...Kb7 is given. This mistake was also introduced very soon after the game, as is shown by the Nieuwe Rotterdamsche Courant, 12 February 1910 (Avondblad, B, page 1). 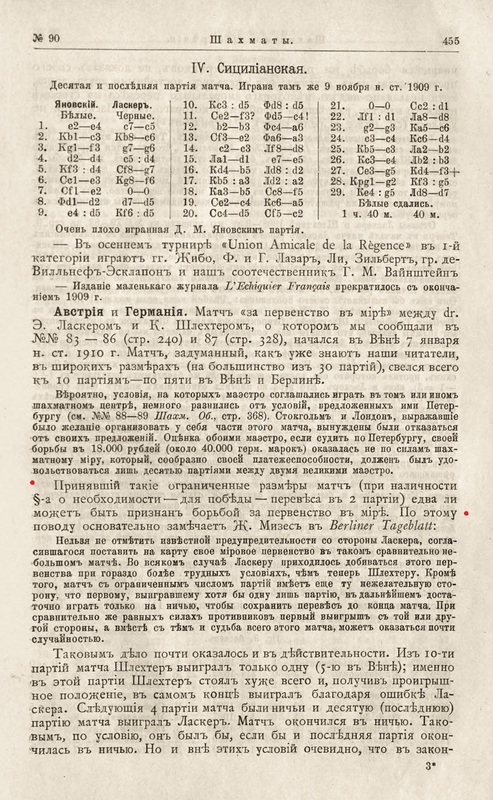 None of the 1910 sources that I have mentioned contains both mistakes, but Chessbase Online Database, NICBase Online, chessgames.com and 365chess.com currently all do, as does Kasparov’s book referred to above (pages 185-186). Both mistakes are also on page 854 of Emanuel Lasker: Denker, Weltenbürger, Schachweltmeister by Richard Forster, Stefan Hansen and Michael Negele (Berlin, 2009), although pages 61f. and 67 of Deutsches Wochenschach 1910 are given as its sources. This column is significant with regard to the controversy over the conditions for the 1910 Lasker v Schlechter world championship match and has been quoted, inter alia, on pages 162-163 of the April 1975 BCM. Illustrierte Kronen Zeitung, 15 January 1910, page 7. Latest update: 21 April 2019.